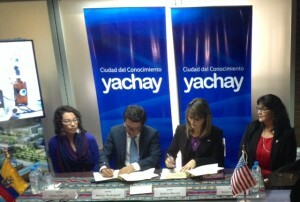 Dean Debbie Mercer and Héctor Rodríguez Chavez, general manager of YACHAY E.P., sign a Memorandum of Understanding establishing this exciting educational partnership. An exciting three-year program gets underway this spring when a group of eight College of Education instructors and a director spend a year in Ecuador to establish the English Language Center at a new university. The Center for Intercultural and Multilingual Advocacy, or CIMA, is spearheading this effort at Yachay University, which means city of knowledge. This partnership is the result of CIMA’s role as the lead institution for the Go Teacher project. When Ecuadorian leaders decided to build a brand new university, they turned to the College of Education at K-State to create the English Language Center. “The purpose of this program is to develop a research-based and innovative curriculum and program model to teach English to entering, first-year, Yachay University students,” said Socorro Herrera, CIMA director. “The main goal is to prepare these students with the English literacy skills and content language proficiency to take courses in both languages. Yachay is expected to attract top students and faculty from around the world, and this international visibility and impact will support many of the college’s K-State 2025 goals and objectives.